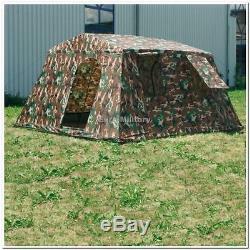 Military Army Outdoor Large BaseCamp Tent Shelter 6 Person Woodland - Brand New. A little bit larger army military basecamp, shelter or home for bigger group, this tent has room for 6 people and their gear. This large tent has flysheet which has a water column of 1500mm and might be a real saviour if you are on a lookout for a tent like this. It does not cost much. The floor of this tent is 10.5m² and height on the inside is quite generos, 180cm, so average height guy could stand inside without problems. The outer is polyurethane coated polyester and all the seams are taped. The floor has a water column of 3000mm. Sturdy steel frame is easy to set up and will keep the tent on place. Two entrances and four ventilation windows with mosquito protection. Flysheet: 100% Polyester (Oxford), Polyurethane coated. Transportation bag: 100% Polyester (Oxford). Dimensions: 340 x 310 x 180cm. Pack size: 125 x 35 x 20cm. Water column: 1500mm (flysheet), 3000mm (groundsheet). 4 ventilation windows with mosquito protection. Comfortable to stand in the tent because of the height. Suitable for military events, actions, outdoor, camping, fishing and other similar outdoor activities. 20Kg - pack size: 125x35x20 cm. The order is sent within 24 hours. Canada 8 - 20 days via Canada post. Europe 6 - 15 days. Rest of the world 8 - 25 days. Any product you return must be in the same condition you received it and in the original packaging. We are a small family business. In this business we work from January 1, 2014. Our main goal is to offer customers a perfect customer service and to providing quality products. Our main product range are mainly manufacturers of the Czech Republic. Because we know that Czech products are of high quality. The item "Military Army Outdoor Large BaseCamp Tent Shelter 6 Person Woodland Brand New" is in sale since Thursday, June 8, 2017.